It's not hard to recycle clothing. If you're anything like me you have a wardrobe full of clothes that you never wear or you bought when you were thinner! If your clothes are barely worn and you feel they could be useful to somebody else the best thing to do with them us to put them in clothing bank or donate them to your local charity shop. That way someone else will get some use out of them. Use this link to find out where you nearest clothing bank is. 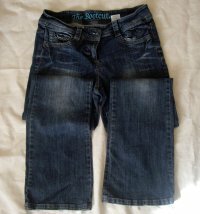 Another way to recycle clothing is to sell any good quality items online and make yourself some money for that great new outfit you've been after. Once you get fed up of an item of clothing it’s a great idea to alter it somehow so that it either becomes something completely different or changes in style so it’s fresh and new. Don’t be put off recycling clothing if you’ve never even picked up a needle and thread! You don’t have to be a seamstress to alter your clothes and you don’t have to know the first thing about the ‘rules’ of sewing. Confidence is a key factor, and don’t forget if you were going to throw it away anyway it doesn’t really matter if you make a mess of it while you are trying to recycle it into something new. Another factor is expense. Spending a lot of money on new bits of trim, binding or embellishment to sew onto a garment can be false economy. A good idea is to cut off buttons, zips and interesting bits of clothes that are worn out before you cut them up to quilt, make into a bag or new item of clothing. That way you have a bag of bits ready that hasn’t cost you a penny. I mentioned quilting as a way to recycle clothing. It’s a new thing for me and until I started writing this web site I had never tried it. I am now devoting a whole section of this website to quilting because of its amazing versatility. Even if you have never even thought of quilting before, it’s not just a way to make huge time consuming quilts! Although that is something you can do if you develop the skill and the patience. 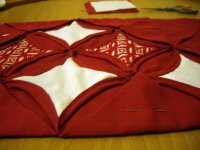 You can use quilting techniques to make so many other useable and attractive things that it’s well worth a go. They are so versatile, even if the knees are worn out the waist band and top seems to always hold together. If this has happened to you favourite jeans then don’t worry. Why not make a skirt out of them? why not make a skirt out of them? This is a pretty simple recycling project and can be done by hand if you haven’t got a sewing machine. 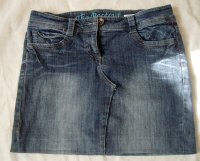 This great little mini skirt to wear in the summer or over your leggings. Ok so your jeans have fallen apart at the waist and the legs are fine! Well why not make a bag out of the material left in the legs. Again it’s all down to your imagination, try to stop thinking of the material as the leg of your jeans and start to imagine your lovely denim bag. This denim bag is a little more challenging than the skirt. You can still do it without any sewing experience, and by hand if you've no sewing machine. Don't forget you were throwing the jeans out anyway so theres no pressure!!! :) Have fun. Trust me once you get started you will be full of recycling ideas and new ways to recycle clothing. Old shirts and blouses that have worn out at the collar or you just have no more use for make fantastic cushion covers. The button up front forms the opening for the cushion and means that all you have to do is sew up the ends! I love to make bags, in fact it’s the main thing I do to recycle old clothes. If you look through them and pick out all the material you like. Then maybe some of the material would be great to line one of your denim bags (when you get more experienced at bag making) Or you might like it enough to use it to make a complete bag. I sometimes like to make the bag look like it’s still the garment it used to be. So for example you have a shirt bag or a t-shirt bag. Take a look at the quilting section for more recycling ideas on bag making. Don’t forget that bag of bits you’ve been collecting. When making bags these bits are invaluable embellishments. Your bag will be unique. 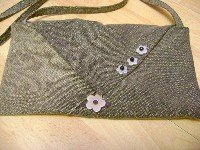 A great way to reuse bits and pieces left over is to make some binding to use for later, that way you can accumulate a bag of extra binding and other bits to grab as you go along.